Plain sewing with 60076m automatic foldover device. The already reshaped bag is introduced into the infeed which folds the bag’s top and simultaneously guides the bag to the sewing head. The sewing process starts when the photo sensor detects the bag. At the end of the process, the rotary knife automatically cuts the thread chain. Motorised system designed to automatically bring the leading edge of the bag into the sewing head without any operator. The infeed guides the bag’s top to the sewing head, allowing the bag to be sewn automatically. All Fischbein infeeds are driven by a motor and belt driven gear box. 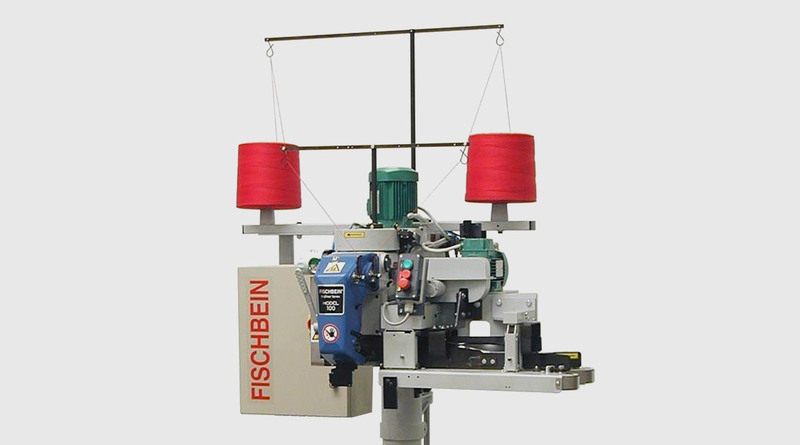 The motor is equipped with an adjustable pulley allowing easy synchronisation with the sewing head and the conveyor belt speeds. They use 19mm wide flat belts for a good grip of the reformed bag’s top instead of dangerous heavy metallic chains. The front section of the infeed is hinged and spring loaded allowing an easy passage of various thicknesses of bag. To close “open mouth” bags made of paper, BOPP laminated, polypropylene or polyethylene (thickness minimum 120u). Maximum 3 plies for flat bags – Maximum 2 plies for gusseted bags. Suitable for maize, four and cereal, milling industries,sugar, pet food, poultry, fertilizer, animal feed, tile grout and chemical industries.